Oats for breakfast is regular item at our house. My 2nd son doesn't like Oats. My first one eats Oats every day. 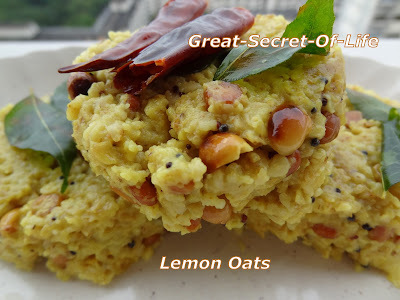 I try different oats dish for weekend brunch or night dinner. I was so lazy to try anything elaborate or new. So I decided to do simple Lemon oats. Put cooked rice in a plate or broad vessel and spread it. Sprinkle one or two teaspoon oil over it. Take out juice from the lemon. In a kadai put the oil and when it is hot add mustard. 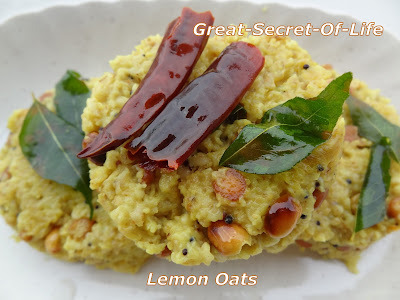 When it pops up, add Bengal gram dhal, urad dhal, and fry till it turns light brown. Add ground nuts, chillies, asafoetida powder and curry leaves and fry for a while.